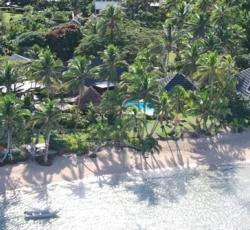 The Beachouse is the perfect place to start off your Fijian adventure. Hectares of beachfront on Fijis famous Coral Coast is yours to appreciate. One of Fijis original and very best backpacking budget resorts. Rates are inclusive of breakfast & afternoon tea daily. The resort with the small Island Experience with the Big Island Convenience. Good location, straightforward to get there. Afternoon tea nice touch. It was set in a lovely location, right on the beach on the Coral Coast. The dorm rooms seemed new and really clean. It is a large slice of paradise for a really very good price! The location, the beach, the food, the activities offered - amazing! The beach was beautiful and the dorms were properly situated in relation to the bar and restaurant. The staff were great, Napoleon was awesome! No cost afternoon tea and coffee served with the most delicious home made scones baked with fresh coconut milk. Would be fantastic to visit solo, w friends, young children or as a group. $20 massages in an outdoor gazebo was the icing on the cake. Clean && chilled, friendly staff, nice beach, activities organized, free scones. Superb value for money! I cannot say a bad word about this spot - it is simply amazing. The location, the people, the accommodation, the food - all fantastic. Much more like hotel quality without the price tag, stuffiness and blandness. * The Beachouse rated 4.56 out of 5 based on 9 customer reviews. Hostel reviews with a star rating are sourced from HostelBookers. If you find The Beachouse with the same booking conditions at a lower rate somewhere else on the internet after you have booked, we will refund you the total difference.